While food poisoning isn’t a huge deal for the young and healthy, people aged 65 and older afflicted with a foodborne illness are at a greater risk. This is because, as we age, our immune systems aren’t as strong, turning the fight against germs into a slow-going, tedious battle. According to Medline Plus the immune system is slower to respond and the healing process slows. A simple case of food poisoning can be life-threatening. 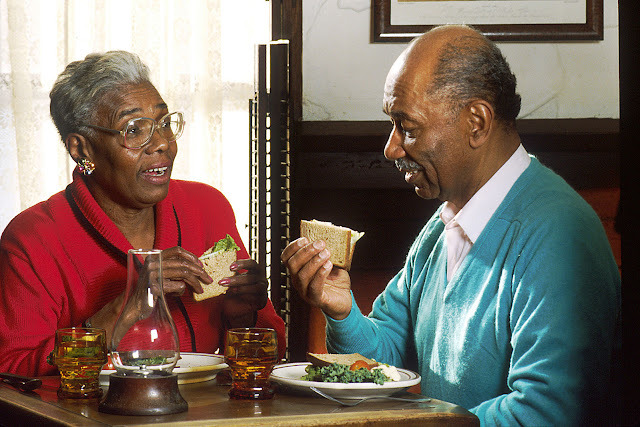 Aside from the inconvenience of the incapacitating illness, older people suffering from food poisoning are likely to experience dehydration as a side effect. If it gets severe, dehydration can cause a drop in blood pressure, limiting the blood supply to the organs. Certain foods are more susceptible to bearing foodborne illness than others. Unless absolutely sure of a food’s integrity, people older than 65 would do well to avoid these foods. Mould-ripened soft and blue-veined cheeses – brie, camembert, Danish blue, gorgonzola, and Roquefort – should be avoided. Any unpasteurised cheese also poses a risk. The aforementioned soft cheeses are less acidic than harder cheeses, housing more moisture. This combination makes for an ideal environment in which harmful bacteria, namely listeria, can grow. Cooking soft cheeses kills lingering bacteria. Fresh or chilled pate, including vegetable and fish varieties, should be avoided. By default, pate contains higher levels of listeria than other foods. Tinned, on the other hand, has gone through a heat treatment as a part of processing, eliminating lingering bacteria. Generally, it’s recommended to steer clear of foods containing raw or undercooked eggs. Aside from the obvious sunny-side up dish, this includes homemade mayonnaise, eggnog, and hollandaise sauce as such things can harbour salmonella. If you must indulge, use pasteurised eggs. When cooking eggs, be sure to cook the whites and yolks till solid. Cold meats, like salami, Parma ham, chorizo, and pepperoni, aren’t actually cooked products. These meats are cured and fermented meaning they can contain toxoplasmosis-causing parasites. To be safe, it’s best to carefully read over the packaging to see if the product needs preparation or if it is ready-to-eat. To be safe, freezing meats for four days before consumption will kill most parasites, making the product safe to eat. If you plan to cook the meat (e.g. pepperoni on pizza), it is not necessary to freeze it beforehand as the cooking process will kill off lingering bacteria. It’s a toss-up as to whether meats cooked at a barbeque will be thoroughly cooked. Rare or undercooked meats (i.e. poultry, burgers, and sausages) are potential sources of salmonella, campylobacter, and E.coli. Before eating anything off the grill, check the thickest part of the item for any pinkness or blood. To be thoroughly safe, a meat thermometer will tell you if meat has been cooked to the right temperature, though you may offend the barbeque host. Cooked shellfish is entirely safe to consume, and pre-cooked prawns are as well. However, be especially careful around raw mussels, lobster, crab, prawns, scallops, and clams which can contain harmful bacteria and viruses. Similarly to raw shellfish, steer clear of dishes made with raw fish. Unless the fish has been frozen before serving, it can contain small parasitic worms that make people sick. If you’re going to a sushi restaurant, rest easy. Sushi shops usually have their raw fish brought in, meaning it was likely frozen beforehand. It is best to ask, just to be safe. Raw, or unpasteurised, milk should be avoided. Stick to the more widely-available ultra-heat treated (UHT) milk sold in grocery stores. For the most part, it’s difficult to find raw milk outside of speciality shops. This advice applies not only to those over 65, but to people with a weakened immune system (pregnant women, babies, and children).